The Institute for Journalism & Natural Resources invites journalists to join us in Milwaukee on August 6th and 7th for a workshop exploring the federal budget proposal and its potential impact in the Great Lakes. Get up-to-speed on the current federal budget proposal and what funding cuts would mean for the Great Lakes Restoration Initiative (GLRI), the Sea Grant program and communities around the Great Lakes Basin. 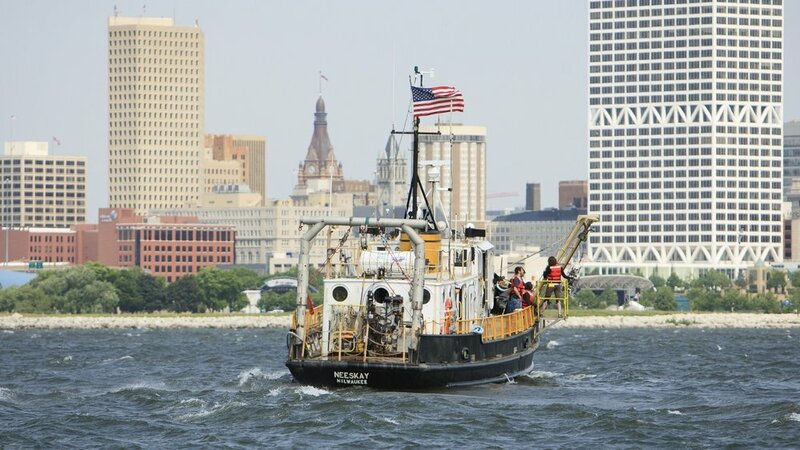 Board the Neeskay research vessel at the University of Wisconsin-Milwaukee’s School of Freshwater Sciences for a trip on Lake Michigan to see first-hand how scientists study and monitor the lakes. Hear from scientists, resource managers and policy experts as they explain how the GLRI works and what it funds – from aquatic invasive species prevention to clean up efforts in Areas of Concern. Meet with Wisconsin’s Sea Grant representatives and explore their role in fostering basic research, sharing information with the public, and promoting healthy and resilient communities and economies in the Great Lakes. Discuss ways to reach bigger audiences and tell better stories when science, environment and politics intersect. The workshop will begin with a dinner on Sunday, August 6th. Programming on Monday, August 7th, will take place at the University of Wisconsin-Milwaukee's School of Freshwater Sciences, and will wrap up by 5 pm. Lodging will be at the Hilton Garden Inn, Downtown Milwaukee. There is a $25 registration fee that will cover lodging on the night of August 6th as well as dinner that night, and breakfast and lunch on the 7th. To register, please email a resume and one clip to contact@ijnr.org (we just need to make sure you're actually a journalist! ), and we'll send you a link to the registration form. Due to group size limitations, the workshop is open to the first 20 registrants.